With the rest of the country up to its collective armpits in snow and winter yuck, Arizona is soaking up the sunshine, which means we’re sneaking up on beer festival season! The season kicks off with the Arizona Beer Week, from February 9 – 18, 2017! Learn more about the Arizona Beer Week Strong Beer Festival here. 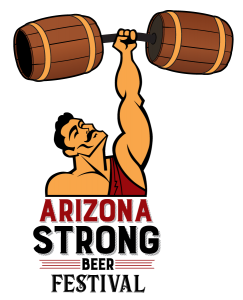 While there are literally events all over Arizona at virtually every brewery, bottle shop and tap room, the first major event is the 17th Annual Arizona Strong Beer Festival on Saturday, February 11, 1:00 – 5:00 pm. If you can only attend one beer event a year in Arizona, this is definitely the one to hit. At last count, there will be 130 breweries from around the country here, and with over 450 craft beers on tap, there will be something for everyone. Tickets start at just $40 for 40 tastes, with (sold out) VIP tickets for $75 and Super VIP, which is now apparently a thing, tickets for $100. Arizona Beer Week is put on by the Arizona Craft Brewers Guild, a fantastic organization that represents nearly 100 breweries, breweries in planning and craft beer businesses in Arizona. Hot on the heels of Arizona Beer Week is the Great Arizona Beer Festival, March 11, 2017 in downtown Phoenix. This amazing craft beer tasting event showcases over 200 beers from more than 50 breweries! And not just from Arizona but around the country, with each one bringing their A-game brews. Another great part: the Great Arizona Beer Festival is a locally-organized fund raising event. All proceeds benefit Sun Sounds of Arizona, a non-profit radio reading service helping 49,000 people in Arizona with print disabilities. 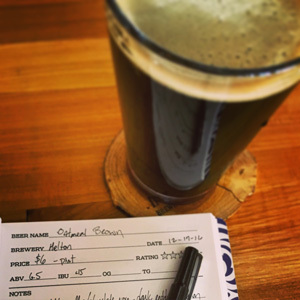 Tasting book, recording the new Oatmeal brown at Helton Brewing in Phoenix. Sure, some of the attendees are going to look at these festivals as giant keggers. To really enjoy the festival and create a lasting impression of the beers you liked (or didn’t), take your time! Actually taste the beers, and bring along a pocket notebook to record your thoughts as you drink each beer. Taking notes as you drink is a lot easier than trying to remember how each beer tasted later. And who knows, if you don’t write it down you might forget you found a new favorite! With 200-beer tasting books or super-easy-to-carry 48-beer pocket size books available, there’s one that suited to you!